Systematic approach of finding new uses for existing drugs. ﻿The development of new therapies is both time-consuming and costly. More than 90% of drugs fail during development, and estimates suggest that in order for a prescription drug to gain market approval it can take more than 15 years and cost $2.6 billion. The same report concludes that another $312 million is needed in post approval development, studies that test new indications, formulation and dosage strengths. One strategy to reduce the time frame, decrease costs and improve success rates is drug repurposing, where known drugs and compounds are applied to new indications. Repurposed drugs can bypass much of the early cost and time needed to bring a drug to market, and has become more important the last few years as many pharmaceutical companies see their pipelines drying up. The American startup Intellimedix is determined to accelerate the discovery and development of new treatments for diseases, and has developed a systematic approach for finding new uses for existing drugs. They work closely with business, academia, non-profits and patient groups to identify needs and solutions that can be delivered quickly. 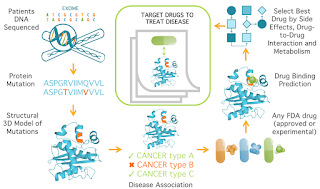 The process begins with getting a full understanding of the underlying mechanisms of the disease, before identifying mutations in exomes of clients using Next-Generation Sequencing. Using a 3D model of the proteins produced by the mutations and articles relating disease to the same mutations, the company can determine the most likely disease-causing mutation with the help of algorithms developed at Georgia Tech. Finally, Intellimedix will screen for small molecules, both experimental and FDA approved, against the specific disease-causing mutation identified. The results will produce a list of drug alternatives that are likely to bind to the protein target. The huge potential of Intellimedix is not only in their close cooperation with other businesses and academia, but how they have the patient in focus during the process. In fact, the company also use their gene sequencing and drug screening capabilities to provide precision medicine to individual patients. With a unique history, untraditional (and welcoming) strategy of open innovation in pharma, and a strong belief in precision medicine, this startup certainly has a future to look out for!